“The PA turned itself into a factory that employs murderers [of] Jews mostly but also Muslims, Christians, Druze, Circassians, and others, including tourists,” said co-sponsor MK Avi Dichter (Likud), who leads the Knesset’s influential Foreign Affairs and Defense Committee. Yesh Atid MK Elazar Stern, who also cosponsored the law, said similar legislation in the US, known as the Tayor Force Act, had prompted the Israeli bill. In an article posted February 28, 2018 on the liberal Arab website Al-Hiwar Al-Mutmaddin (ahewar.org), Iraqi Muslim Arab writer 'Ali 'Abd Al-Karim Al-Sa'di harshly criticized Muslim Arabs, saying they are racist, greedy, harbor expansionist aspirations, and hate the other – yet, by a double standard, they attribute all these traits to Israel, and raise their children to hate it and also to hate all those who are not Muslim Arabs. For example, he wrote, the Arabs and Muslims vilify Israel for occupying Palestine, and accuse it of grave crimes and evil intentions, but at the same time take pride in their own conquest of more than 20 lands in the early Islamic era. As an example of the Arab lust for conquest, Al-Sa'di presents Iraq itself, which he said was neither Arab nor Muslim because it was once populated by members of various cultures, religions, and ethnicities, prior to the first conquests of the area in the early Islamic era when Muslim Arab tribes from Yemen and the Hejaz arrived and forced Islam and the Arab identity on the locals. He added that Syria, Lebanon, Egypt, Algeria, Morocco, Tunisia, and other countries were also originally neither Arab nor Muslim, but were forcibly Arabized and Islamized, often by means of massacring their residents. Pointing at the Arab Muslims' deeply rooted hatred of the other, he described how Iraqi children are raised to believe that the Sabians  are tainted and that they not must come into contact with them nor partake of their food or drink. "Who, then," he asked, "are the Nazi racists who lust for expansion and conquest?" 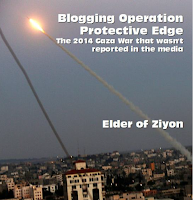 – hinting at Arab accusations against Israel. Al-Sa'di concluded by condemning the Muslims' appropriation of God, the next life, and Paradise, excluding from them non-Muslims; he called it "a corrupt, racist, and Nazi idea" and added that all this makes him ashamed to be an Arab. Iranian President Hassan Rouhani departed on Monday for a trip to Europe billed as of “prime importance” after the US pulled out of the 2015 nuclear deal between Tehran and world powers. Rouhani was set to visit Switzerland and Austria as part of Tehran’s ongoing efforts to secure Europe’s continued support for the landmark agreement, a month after Prime Minister Benjamin Netanyahu toured the continent to persuade leaders to leave the agreement, which has been repeatedly slammed by Israel. An Iranian diplomat has been arrested along with two people suspected of plotting a bomb attack on a meeting of an exiled Iranian opposition group in France, Belgian authorities said on Monday. Turkish president Recep Tayyip Erdoğan’s victory in the June 24th elections marks a major advance in his years-long march toward one-man rule. So clear is his progress, in fact, that over the past year or so, even Juan Cole has become a former Erdoğan apologist and has taken to condemning the Turkish strongman. It’s a pity – though hardly a surprise – that this change of heart comes two years too late to help thousands of Turkish academics fired and jailed in the aftermath of the failed July, 2016 coup attempt against Erdoğan. But when Turkey’s professoriate was under direct attack from the government in the immediate aftermath of the failed July, 2016 coup attempt, Cole was hobnobbing with the Erdoğan’s academic supporters at an Istanbul hotel. In October, 2016 he joined other scholars from the U.S. and Europe for a regime-sponsored conference titled “Envisioning a Post-Crisis Regional Order for the Sharq [East] Region.” As Campus Watch Fellow A.J. Caschetta reported at the time, the event featured no fewer than half a dozen members of Erdoğan’s government, including his spokesman Ibrahim Kalin, a George Washington University Middle East studies Ph.D. and senior fellow at the Prince Alwaleed Bin Talal Center for Muslim Christian Understanding at Georgetown University. But that mattered not a whit to Cole, who was happy to accept Ankara’s largesse. He must also have known by then that his fellow American, Henri Barkey of the Woodrow Wilson Center in Washington, was among those blamed by Erdogan’s press minions for orchestrating the rebellion – a blatantly absurd charge. The Scottish rappers Young Fathers have earned critical praise for their blend of hip-hop, electronica and gospel. They won Britain’s prestigious Mercury Prize for album of the year. Their sweaty, uplifting shows are in demand across Europe. But when an arts festival in Germany decided last month to drop the band from its bill, it set off a clamor that had nothing to do with the group’s music, and everything to do with the country’s post-World War II sensibilities. Young Fathers openly support the Boycott, Divestment and Sanctions movement, also known as B.D.S., which asks companies and people to avoid doing business with Israel in protest of its treatment of Palestinians. But in Germany, where calling for a boycott against the Jewish state carries deep historical associations with the Nazis, the movement is widely viewed as anti-Semitic. As Germany struggles with increasing attacks on Jews and Israel is under pressure for killings of protesters along its border with Gaza, a growing clash over B.D.S. is spilling over into the cultural scene. It has divided art and music festivals that aim to foster cultural dialogue, and even sparked a feud between the mayor of Munich and Roger Waters of Pink Floyd, who is a revered figure here. B.D.S. is well known for sparking confrontations on college campuses in the United States and for compelling entertainers to pick sides. Now support from British artists is raising its profile in Germany, where it has struggled to gain traction. The High Court of Justice in Spain’s Asturias province ruled that a city council’s policy of boycotting Israel was unconstitutional. Last year, the City Council of Castrillon in northern Spain passed a motion effectively boycotting Israel, Israeli businesses and companies during business with Israel. According to the Lawfare Project, which challenged the city council’s motion, court said that this policy of boycotting Israel was in breach of constitutional civil rights and freedoms of nondiscrimination and equality before the law. Since the beginning of March, legal action by the Lawfare Project has resulted in seven other courts across Spain annulling or suspending anti-Israel boycotts in the cities of Castrillon, Telde, Montcada, La Roda, Barbate, Artes and Viloria. However, the attempts to boycott Israel have continued in Spain in recent weeks. Earlier in June, the city of Oviedo, the capital of Spain’s Asturias region, canceled an upcoming concert by Israel’s NK Orchestra and a ballet performance due to political reasons. As we discussed in our prior posts, for years Newton high schoolers learned from a factually-flawed, unvetted, superficial and non-scholarly curriculum, and from horribly slanted, “inaccurate and partisan” materials—many of them written by virulently anti-Israel activists an radical Islamist apologists. By last year, it appeared that the parents and advocacy groups had pretty much prevailed. Mayor Ruthanne Fuller had promised greater transparency in what was being taught in the schools. Some of the most offensive teaching materials had also already been removed from the curriculum used in the Middle East unit of the World History classes taught in the high schools when the District promised not to teach the subject until a new curriculum could be developed and properly vetted. But now it looks like the Newton Public School Committee and its Superintendent David Fleishman are going back on their word. According to APT, students continue to be given biased and anti-Israel material in their classrooms. Luxury Swiss watchmaker Hublot has designed 70 limited edition watches on the occasion of Israel’s 70th birthday – 10 of which will be sold in Israel – as a “moving gesture” towards Israel. They quite frankly look magnificent. 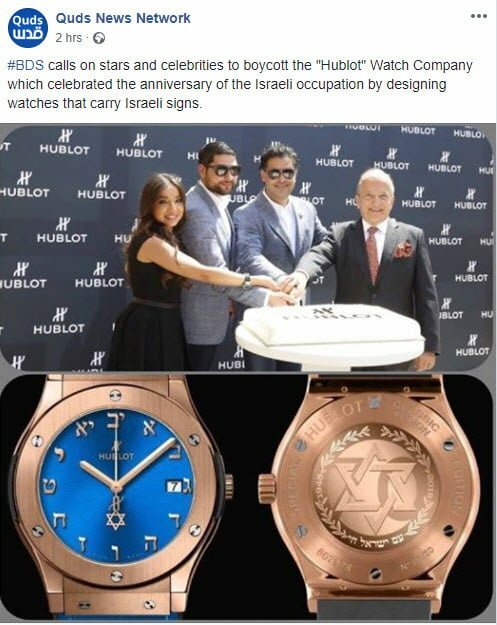 I thank Hublot for recognizing that it is past time to support Israel. And if any of you have a thing for luxury watches (as well as that thing called money), please consider purchasing one of these fine watches! I know I would if I could. Spokespeople for the administration of President Nicolás Maduro laced into protesters and the opposition this morning, accusing them of disloyalty for harboring such treasonous, imperialist notions as trying to stave off malnutrition, and called the pursuit of such ends evidence that Zionism has poisoned their minds. A series of coordinated messages from the presidential palace targeted prominent figures and demands of Venezuela’s restive population, as years of inflation, shortages, corruption, and spiraling violence continue, sparking political turmoil. The messages called the very idea of having enough to eat an “imperialist Zionist” conceit, and warned Venezuelans not to fall into the trap of those who would undermine Bolivarian Democratic Socialist values by appealing to such base instincts as survival. But, according to the United Nations, a scientific journal, Palestinian sources, and the European Gaza Hospital (a public institution), along with mainstream media, there are indeed MRI machines in Gaza. Notably, a 2017 report in The Journal of Radiation Research and Applied Sciences (“Evaluation of advanced medical imaging services at Governmental Hospitals – Gaza Governorates, Palestine“), noted there are two MRI machines in the Gaza Strip per one million inhabitants. This compares to four MRI machines in Israel per one million inhabitants. Both Israel and the Gaza Strip lag significantly behind other countries, including Turkey, France, Australia, and especially Germany (Table 2, page 5). In April, the Facebook page of the MRI Department at European Gaza Hospital publicized that it received a new MRI system by Philips Healthcare. In recent days, the Gaza Strip’s MRI machines have been in the news following devastating airborne arson attacks that Gazans have launched against Israel using helium inflated balloons and kites, destroying some 30,000 dunums of Israeli farmland and nature reserve land, and killing wildlife. As a result, Israel decreased the amount of helium it exports to the Gaza Strip, which has put at risk the ongoing use of MRI machines. Twitter has blocked two accounts belonging to Hamas and closed or blocked some 35 active Hamas and Hezbollah accounts in Israel. The letter supplied a partial list of Twitter accounts affiliated with terror organizations and threatened legal action if they are not removed. 13 Hamas & Hezbollah Twitter accounts shut down. 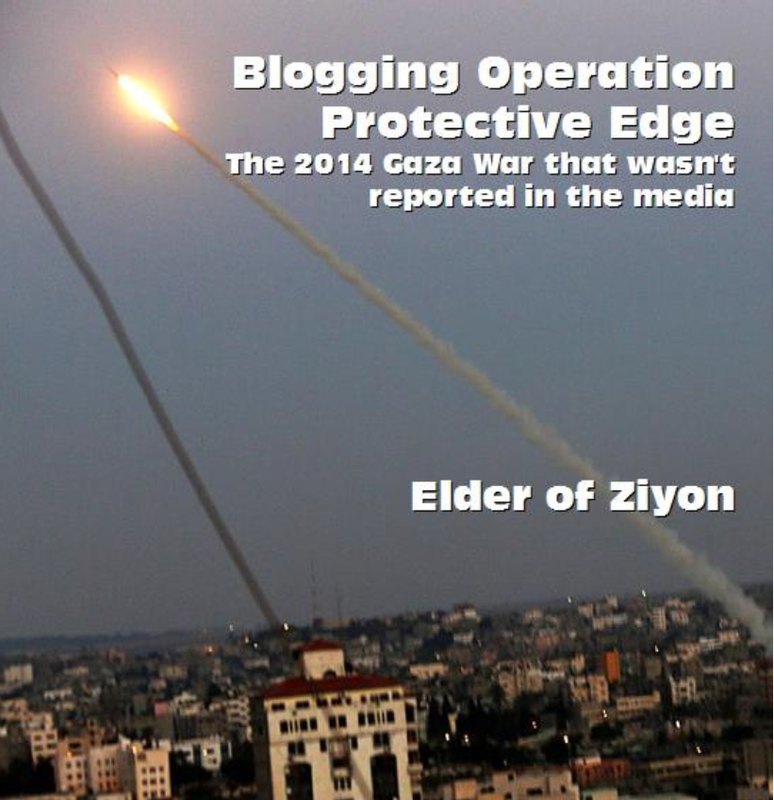 23 blocked in Israel. Work in progress. Former Republican congressman and US presidential candidate Ron Paul on Monday was slammed as anti-Semitic and racist on social media over a cartoon he shared before quickly deleting. The caricature portrayed members of various minority groups with distorted features, including a Jewish man with a large nose, beard and skullcap. Their outstretched arms join into a red fist adorned with the symbol of the Soviet Union and they cheer for “Cultural Marxism,” as they punch Uncle Sam in the face. The cartoon was quickly deleted and replaced with an image of the words “political correctness” with a “No” symbol over them. Paul later wrote on his social media accounts that the cartoon was “inadvertently” posted by a staff member. “I do not make my own social media posts and when I discovered the mistake it was immediately deleted,” he said. Fifteen years after the controversial filmmaker’s death, items from Helene “Leni” Riefenstahl’s estate will go on display at Berlin’s Museum of Photography. The planned exhibit, warn some critics, runs the risk of absolving Riefenstahl of responsibility for her pro-Nazi films, as well as her dubious wartime activities. In 2003, the woman once known as “Hitler’s favorite filmmaker” died at the age of 101. Some 700 cases from Riefenstahl’s estate were donated to the museum by her secretary. Now, curators will have access to thousands of letters and film stock dating to the 1920s, as well as gowns worn by Riefenstahl, and her diving suit from a late-in-life hobby she turned into a documentary on coral reefs. For the exhibit’s detractors, the project is “an absurd and disgusting obscenity” that will glorify the late director’s “fascist aesthetics” and advance a rehabilitation that Riefenstahl does not deserve. Riefenstahl was the first woman to earn international attention as a filmmaker, directing the Nazi-glorifying “Triumph of the Will” and “Day of Freedom: Our Army.” Relying on her close relationship with Hitler, Riefenstahl crafted films that mesmerized the German public and audiences abroad. In “Olympia,” the racially conscious Olympics extravaganza, she pioneered several techniques. During a tour of the United States to peddle “Olympia” in November 1938, Riefenstahl claimed reports of the Kristallnacht pogrom in Germany were not accurate. She was promptly blacklisted by most studio heads, although Walt Disney took a half-day meeting with her. It did not help her cause that Riefenstahl had just removed the names of Jews from the credits of her 1932 film “The Blue Light,” which she wrote, directed and starred in as a “sympathetic” mountain witch, Junta. A group of Yazidis has recently traveled to Israel from Iraq and taken a course in medical clowning, with the goal of helping traumatized children from persecuted minorities in the war-ravaged country. The course was prepared by Dram Doctors, an organization that trains medical clowns, as well as the UK-based Road to Peace charity, Jerusalem’s Hadassah hospital and Israel’s Foreign Ministry, the ministry said in a statement Sunday. “The participants in the special training left Israel during the weekend with new tools and techniques that will help them put smiles on the faces of people who live in war zones, regardless of their ethnicity, religion or gender,” the Foreign Ministry said. Road to Peace, which the ministry said had facilitated the arrival of the Yazidis to Israel, was established in 2014 to help build alliances between communities in conflict zones and help provide medical treatment to sick and wounded children. The organization recently established a unit to treat kids in the region of Sinjar in northern Iraq, directed by Jewish humanitarian Sally Becker. IDF soldiers watchfully looked on during a daring rappelling operation along the Lebanon border on Friday. The mission — to save intact pottery vessels dating to over 2,000 years ago — was a success. In a brief video of the rescue operation, we see climbers suspended in air, hitched to a doubled rope fixed to a point 30 meters up a sheer cliff. They make their way up the rocky surface and upon reaching the mouth of a cave, the slight figures barely fit through to rescue its precious contents. The vessels are slid 30 meters down on ropes. The fragile finds, including two intact wine amphorae, several storage jars, a bowl, a cooking pot, and two juglets, were wrapped in bubble wrap and sent down in padded bags in a complex joint operation of the Zefat Academic College, the Israel Antiquities Authority (IAA), the Israel Cave Research Center and the Israel Cave Explorers Club. “I crossed my fingers every time” a pot was lowered, Dr. Danny Syon, senior archaeologist with the IAA, told The Times of Israel. It was no mean feat, especially considering the leaders of the cliff cave excavation, Syon and Dr. Yinon Shivtiel of the Zefat Academic College, are both in their 60s. 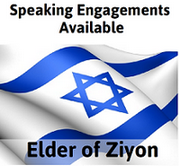 Syon, 64, was a rappelling instructor about 45 years ago, he told The Times of Israel. “Some things are like riding a bicycle,” said Syon.